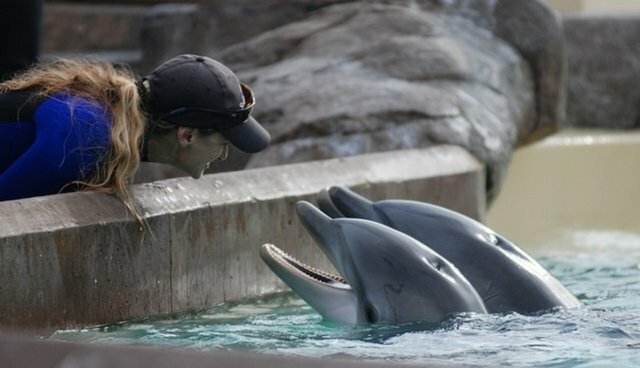 In situations of great stress in captivity they (dolphins) have been known to commit suicide by starvation, battering against walls, or drowning. -- The Columbia Encyclopedia, 6th Edition 2001-05. When you consider that dolphins and other whales have been around on this planet for at least 50 million years, compared with much less than a single million years for us human beings, you have to wonder how we got control over them so quickly. They have larger brains than we have. They're bigger and stronger, faster, sleeker and altogether more perfectly formed than we are. And yet, just as we have come to dominate 30 percent of the world (that which is above water) in the short time we've been around, we could say that dolphins and other whales are the dominate species in the other 70 percent, which is water. Well, as we all know, the short answer is that we have a history of this. You may recall that slavery was only recently deemed unacceptable. Almost certainly that happened because it was no longer economically feasible. Indeed where it is feasible, as in enforced prostitution of children and things like that, it still goes on like crazy. Maybe at the heart of all this is our sophisticated world-wide economic system whose goal is to maximize profits regardless of collateral damage. But the history of slavery in general is a clue to how we can stop this travesty. If we stop it from being profitable, it will go away. The first so-called dolphinarium began in 1938 at Marine Studios in St. Augustine, Florida, USA. Now there are scores of dolphinaria all over the world, and more all the time are being established. If you could collect all the abuse to dolphins and other whales, the pain, the horror, frustration, the dolphin suicides, the cries for help -- if you were to gather all these atrocities from over the years it would be like a thousand hells. Most countries would not permit this abuse for the real reason they exist: money. Most countries have laws against cruelty to animals, laws that began early in the 19th Century. But obviously these laws have a loophole because, despite all our efforts, displaying dolphins publicly for money is now a multi-billion dollar industry. Hunters of dolphins, suppliers and shippers, marketers, park construction workers, trainers -- this list goes on and on and they all cash in. Some nations allow it because they've got bigger problems. Some nations see nothing wrong with it. The rest allow it for the wrong reason: that it's educational. They say that many people would never get to see a dolphin except for the dolphinaria. But what about all the people who will never see a snow leopard? saber-toothed tiger? Or the dodo bird? On and on. Taken even at face value, their argument is a fraud, because these dolphinaria are not educational, they're anti-educational. They show not a dolphin in his own world but a trained dolphin, a dolphin trained to act like a clown, in our world. A lot of misguided talk surrounds another similarity between human beings and dolphins in captivity: their committing suicide when stressed. When dolphins in captivity are greatly stressed, they sometimes obviously feel the need to escape by whatever means. This is a big problem because they don't have guns or poison as we do in such circumstances.What can they do? Some of these dolphins batter themselves to death against the walls of their prison. Others refuse to eat until they waste away and die. 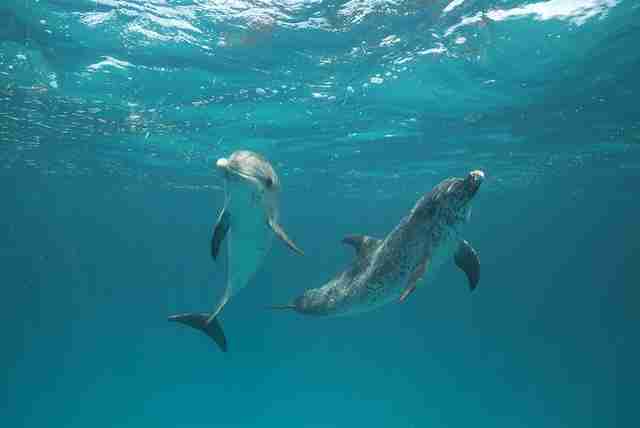 Dolphins and other whales are not like any other mammal in the way they breathe. While humans and all the other mammals breathe automatically, dolphins don't have that automatic reflex; every breath they take is deliberate. When human beings fall into deep water, we drown because we lose consciousness and then, when the automatic reflex kicks in, we breathe water. Not so the dolphin. The dolphin will kill himself by drowning if he deliberately breathes water, but, more likely, he dies for lack of oxygen in his blood caused by not breathing at all. This suicide option the dolphin takes is another proof of his self-awareness, without which suicide would never even occur to him If words alone, if logic, reason, facts and history were enough to destroy the dolphin industry that has warped our lives, they would be long gone now. We need more than words, we need laws to stop them. We know that it cannot be done overnight. It may take many years. We may even have to compromise a little. But now is the time to start eliminating this evil or it will never happen in our lifetime.